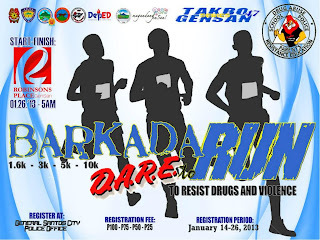 Starting the new year healthy and right as General Santos City Police Office (GSCPO) has resumed with their Tabko Gensan Series with TGS 47 slated this January 26, 2013 at Robinson's Place. The categories include 1.6km, 3km, 5km, and 10km for a meager registration fees which oftentimes used for communities adopted by the GSCPO. As support and as part of my marathon training program, I shall once again run a 10km with my running gear including my music mp3. But with constant rain due to low pressure and ITCZ, I could only be anxious with my non - waterproof music player. If only I could find the budget to finally buy a SONY music player and record some music along with some great songs from superb musicians. 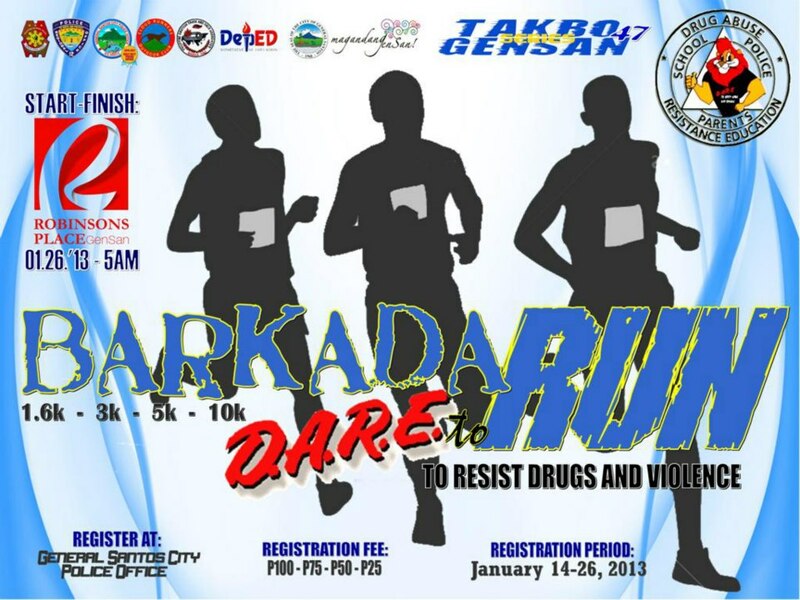 I hope a good numbers shall attend this fun run and hit the road again.